(CNN) -- Nearly half a century ago, 13 female pilots proved they were as fit to go into space as the men who became immortalized as America's first astronauts, the Mercury 7. The women underwent the same intensive medical tests, at the same Albuquerque, New Mexico, clinic, administered by the same staff, as the men did two years earlier. What was the women's biggest obstacle? "Ovaries," said Kilgore. "The world just wasn't ready at that time." On Saturday, the "Mercury 13" women received honorary Doctor of Science degrees from the University of Wisconsin Oshkosh at its commencement. "While the Mercury 13 did not get their shot at space -- at least not yet -- they refused to let someone else trim their dreams. They fought for what they wanted, what they believed in, and spoke out against discrimination," said keynote speaker Martha Ackmann, author of "The Mercury 13: The Untold Story of Thirteen American Women and the Dream of Space Flight." Recognition has been slow in coming, but in recent years the women have been honored by the Adler Planetarium, Women in Aviation International as well as their state aviation halls of fame. An exhibition about their tests is now on display at the International Women's Air and Space Museum in Cleveland, Ohio. The 13 included Jerrie Cobb, Gene Nora Jessen, Wally Funk, Irene Leverton, Myrtle "K" Cagle, Jane Hart, Jerri Truhill, Rhea Hurrle Woltman, Sarah Ratley, Bernice "B" Steadman, Jean Hixson, Jan Dietrich and Marion Dietrich, Jan's twin. (Learn more about the Mercury 13). "We proved beyond a shadow of a doubt that women could do it," said Truhill, now 78. "It just took NASA 30 years." Her fellow "girls," as Truhill calls the pilots, range in age from late-60s to 85. Marion Dietrich and Jean Hixson have died. It was Cobb, Truhill's friend from air races, who first attracted the interest of Dr. Randy Lovelace. By 1960, the 28-year-old Cobb had set four world aviation records for speed, distance and absolute altitude. Lovelace was chairman of NASA's Special Life Sciences Committee and had helped draw up the criteria for NASA's first astronaut candidates. He had heard that Russia was considering sending a woman into space. Women were physically smaller, lighter and would take up less oxygen than men. The question was: Could they withstand the psychological and physical stresses of space? In a private effort, Lovelace decided to put Cobb through all phases of the Mercury astronaut tests to find out how women held up. She so impressed Lovelace that he wanted to find out: Was she a fluke, or were women as viable as men to be space capsule candidates? With Cobb's help, Lovelace recruited another 25 female pilots to undergo the same tests. Twelve passed "with flying colors," said Kilgore. Ice water was injected into their ear canals to induce vertigo. They swallowed rubber tubes to test their stomach acid. For a sensory isolation test, they were submerged in water and darkness. Blood was drawn, stools were counted. And there were all those enemas. "They emptied you out," said Gene Nora Jessen. "They did lots and lots of X-rays. I don't know how we don't have cancer." Cobb would refer to herself and the finalists of this first round of testing as FLATS, for "First Lady Astronaut Trainees." Once the women were past the physical tests, they were invited to the Naval Air Station in Pensacola, Florida, for flight tests. This second phase of testing would address NASA's requirement that an astronaut must be a military test pilot, and for the women it represented a taste of what was unattainable. A military test pilot had to have graduated from one of the test pilot schools, and enrollment of females into U.S. military academies was still nearly 15 years away. Days before reporting to Pensacola, the women received telegrams that their program had been canceled. Cagle recalls crying about the news: "My husband said, 'Honey, look how close you came. Look at who didn't make it.' "
Kilgore said that while there was no official intent to put women in the space program, Lovelace thought he could do the tests and prove the women qualified. His position with NASA "meant that he was in the position to send recommendations," Kilgore said. He never got that far; the Navy said no. Efforts by Cobb and Hart to get women included in NASA went as far as Capitol Hill in 1962, where they testified on behalf of the Mercury 13 women at congressional hearings. The efforts failed, and less than a year later, Russia launched Valentina Tereshkova, the first woman in space. Not until 1983 -- more than 20 years later -- did the United States send its first woman, Sally Ride, into space. 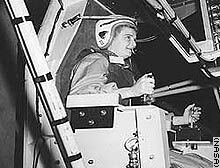 In the 1960s, women pilots underwent physical tests similar to those taken by the Mercury astronauts. The Jerrie Cobb Foundation, Inc.